What was the Bhopal disaster? The Bhopal disaster (also referred to as the Bhopal gas tragedy) was a gas leak in Bhopal, India, that happened in December of 1984. At the Union Carbide plant in Bhopal, methyl isocyanate gas was accidentally released during a manufacturing process. The gas poisoned thousands of people in the surrounding city, most of whom were asleep when the gas leak occurred. The effects of the release of this gas were felt for years to come, with over half a million injuries reported in the nearly three decades since the incident. Following this accident, criminal and civil suits were filed against the company and several of its highest-ranking employees. 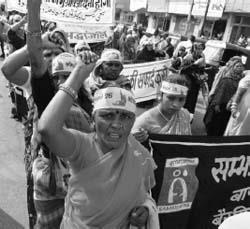 Protesters in Bhopal, India, rage against the injustice of the Union Carbide plant disaster that poisoned thousands with methyl isocyanate gas.